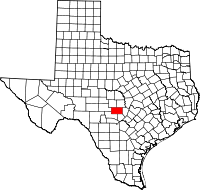 Gillespie County is a county located on the Edwards Plateau in the U.S. state of Texas. As of the 2010 census, its population was 24,837. The county seat is Fredericksburg. It is located in the heart of the Texas Hill Country. Gillespie is named for Robert Addison Gillespie, a soldier in the Mexican–American War. On December 15, 1847, a petition was submitted to create Gillespie County. In 1848, the legislature formed Gillespie County from Bexar and Travis Counties. While the signers were overwhelmingly German immigrants, names also on the petition were Castillo, Pena, Munos, and a handful of non-German Anglo names. Gillespie County comprises the Fredericksburg, TX Micropolitan Statistical Area. Early native inhabitants were the Tonkawa, Comanche, Kiowa, and Lipan Apache peoples. In 1842, the Adelsverein organized in Germany to promote emigration to Texas. The Fisher–Miller Land Grant set aside three million acres (12,000 km²) to settle 600 families and single men of German, Dutch, Swiss, Danish, Swedish, and Norwegian ancestry in Texas.Henry Francis Fisher sold his interest in the land grant to the Adelsverein in 1844. Prince Carl of Solms-Braunfels secured the title to 1,265 acres (5.12 km2) of the Veramendi grant the next year, including the Comal Springs and River, for the Adelsverein. Thousands of German immigrants were stranded at port of disembarkation, Indianola, on Matagorda Bay. With no food or shelters, living in holes dug into the ground, an estimated 50% die from disease or starvation. The living began to walk to their destinations hundreds of miles away. About 200 German colonists, who walked from Indianola, founded the town of New Braunfels at the crossing of the San Antonio-Nacodoches Road on the Guadalupe River. John O. Meusebach arrived in Galveston. The first wagon train of 120 settlers arrived from New Braunfels. Surveyor Hermann Wilke laid out the town. Meusebach named it Fredericksburg, in honor of Prince Frederick of Prussia. In 1847, the Meusebach–Comanche Treaty was made. About 150 settlers petitioned the Texas Legislature to establish a new county, suggested names "Pierdenales" or "Germania". The Vereins Kirche became the first public building in Fredericksburg. It served as a nondenominational church, school, town hall, and fort. Locals referred to it as “the Coffee Mill Church” for its shape. Wilhelm Victor Keidel was the county's first doctor. Mormon leader Lyman Wight founded the community of Zodiac. The Legislature formed Gillespie County from Bexar and Travis Counties in 1848. They named it after Tennessee transplant Capt. Robert Addison Gillespie, a hero of the 1846 Battle of Monterrey in the Mexican–American War. Fredericksburg became the county seat. Fort Martin Scott was established in 1848 at Barons Creek, a Pedernales tributary. An angry mob of soldiers burned down the store-courthouse in 1850, destroying all county records. The melee apparently started when County Clerk John M. Hunter, who also owned the store, refused to sell whiskey to a soldier. Words were exchanged, and Hunter stabbed the soldier; about 50 soldiers stormed and burned the store, destroying all contents. Soldiers prevented townspeople from saving the county records. John O. Meusebach was elected to the Texas Senate in 1851 to represent Bexar, Comal, and Medina Counties, and in 1854, received a special appointment as commissioner from Governor Elisha M. Pease to issue land certificates to those immigrants of 1845 and 1846 who had been promised them by the Adelsverein. The Texas State Convention of Germans met in San Antonio and adopted a political, social, and religious platform, including: Equal pay for equal work, direct election of the President of the United States, abolition of capital punishment, "Slavery is an evil, the abolition of which is a requirement of democratic principles", free schools – including universities – supported by the state, without religious influence, and total separation of church and state. In 1852, Bremen seaman Charles Henry Nimitz, grandfather of Fleet Admiral Chester Nimitz, built the Nimitz Hotel in Frederickburg. In 1870, he added a steamboat-shaped façade. Surveyor Jacob Kuechler was commissioned as a captain by Sam Houston to enroll state militia troops in Gillespie County. Texas seceded from the Union in 1861, and joined the Confederate States of America, and Houston was dismissed from office in March by the Confederacy. Gillespie County voted 400 -17 against secession from the Union. Unionists from Kerr, Gillespie, and Kendall Counties participated in the formation of the Union League, a secret organization to support President Abraham Lincoln’s policies. Kuechler signed up only German Unionists in his frontier company, and was dismissed by Governor Francis R. Lubbock. In 1862, 54 Gillespie County men joined the Confederate Army. Eventually, 300 enlisted with the CSA to avoid conscription. The Union League formed companies to protect the frontier against Indians and their families against local Confederate forces. Conscientious objectors to the military draft were primarily among Tejanos and Germans. Confederate authorities imposed martial law on Central Texas. The Nueces massacre occurred in Kinney County. Jacob Kuechler served as a guide for 61 conscientious objectors attempting to flee to Mexico. Scottish-born Confederate irregular James Duff and his Duff’s Partisan Rangers pursued and overtook them at the Nueces River; 34 were killed, some executed after being taken prisoner. Jacob Kuechler survived the battle. The cruelty shocked the people of Gillespie County. About 2,000 took to the hills to escape Duff's reign of terror. Kiowa raiders massacred residents of the McDonald farm in the Harper vicinity in 1864. During 1865, Gillespie County suffered a war-time crime wave, as 17 individuals were convicted of murder. In 1870, Herman Lehmann and his brother Willie were captured by Apaches, but Willie escaped within days. Herman Lehmann, escorted by soldiers, was finally returned to his family in 1878. In 1881, Gillespie County became the first county in Texas to hold a fair. From 1874–75, Andreas Lindig built the county’s first lime kiln. The original Gillespie County Courthouse was constructed in 1882; it later became the Pioneer Memorial Library. Chester W. Nimitz, future Commander in Chief, United States Pacific Fleet, was born in 1885 in Fredericksburg. His father, Chester B. Nimitz, died before his birth, leaving his seaman grandfather as role model. John O. Meusebach died at his farm at Loyal Valley in Mason County on May 27, 1897, and was buried in the Marschall Meusebach Cemetery at Cherry Spring. In 1908, future President of the United States Lyndon B. Johnson was born in a small farmhouse on the Pedernales River. Johnson became the Vice President of the United States in 1961 and subsequently President of the United States. His ranch at Stonewall was known as the Texas Whitehouse. Tourism became an important industry. On January 22, 1973, President Johnson died at his Stonewall ranch. He, and later Lady Bird Johnson, were laid to rest at the family cemetery on the ranch. The Gillespie County Historical Society was formed in 1934, and the Pedernales Electric Cooperative was formed to provide rural electrification four years later. In 1948, the County began its annual Easter Fire event to commemorate the Meusebach treaty signing. Admiral Nimitz died February 20, 1966, and was laid to rest at the Golden Gate National Cemetery. The next February, the Fleet Admiral Chester W. Nimitz Memorial Naval Museum opened in the old Nimitz Hotel on Main Street in Fredericksburg. The Japanese Garden of Peace, a gift from the people of Japan, was dedicated on the 130th anniversary of the founding of Fredericksburg at the Nimitz Museum on May 8, 1976. In 1981, the state legislature placed the Nimitz Museum under Texas Parks and Wildlife Department as the National Museum of the Pacific War. The Texas White House officially opened to the public August 27, 2008. In 2009, the George H. W. Bush Gallery opened at the Nimitz museum. According to the U.S. Census Bureau, the county has a total area of 1,062 square miles (2,750 km2), of which 1,058 square miles (2,740 km2) is land and 3.5 square miles (9.1 km2) (0.3%) is water. As of the census of 2000, 20,814 people resided in the county, organized into 8,521 households, and 6,083 families. The population density was 20 people per square mile (8/km²). The 9,902 housing units averaged nine per square mile (four per km²). The racial makeup of the county is 92.82% White, 0.33% Native American, 0.21% Black or African American, 0.18% Asian, 0.02% Pacific Islander, 5.27% from other races and 1.18% from two or more races. About 15.90% of the population is Hispanic or Latino of any race. In terms of ancestry, 40.8% were of German, 10.3% were of English, 10.0% were of Irish, 6.0% were of American, 3.1% were of Scotch-Irish, 2.5% were of Scottish,2.5% were of French. In 1990, about 3,000 speakers of Texas German were in Gillespie and Kendall Counties, but this is believed to have declined since. Of the 8,521 households, 25.90% had children under the age of 18 living with them, 62.10% were married couples living together, 7.00% had a female householder with no husband present, and 28.60% were not families. About 25.80% of all households were made up of individuals and 14.20% had someone living alone who was 65 years of age or older. The average household size was 2.38 and the average family size was 2.84. In the county, the population was distributed as 21.60% under the age of 18, 5.50% from 18 to 24, 21.20% from 25 to 44, 26.20% from 45 to 64, and 25.50% who are 65 years of age or older. The median age was 46 years. For every 100 females, there were 89.70 males. For every 100 females age 18 and over, there were 88.10 males. The median income for a household in the county was $38,109, and for a family was $45,315. Males have a median income of $26,675 versus $20,918 for females. The per capita income for the county was $20,423, and 10.20% of the population and 7.10% of families were below the poverty line. Of the total population, 13.40% of those under the age of 18 and 9.90% of those 65 and older were living below the poverty line. Gillespie County is something of an aberration in that it is a historically Republican county in a state that was overwhelmingly Democratic up until recent decades. This is largely due to the heavily German American heritage of the county and that Gillespie was the centre of Texas’ small Unionist movement during the Civil War, when most Texas Germans acquiesced to secession but Fredericksburg was still self-sufficient and sold surplus food to the army. Gillespie County has been won by Republicans in every election since 1896 with only a handful of exceptions. Theodore Roosevelt’s Progressive Party won the county in 1912 (but carried no other counties in the state). In 1924, it was one of only two Texas counties won by Progressive candidate Robert M. La Follette Sr.. Gillespie County has only ever backed a Democratic nominee in 1932 and 1964, both of which were landslide victories for the party, and the latter being for county native Lyndon Johnson. Indeed, no Democrat since Jimmy Carter in 1976 has received so much as 22 percent of the county’s vote. Franklin D. Roosevelt's 1932 performance in the county is notable, as he won it by almost 60 percentage points despite the county's massive Republican lean (see the table below). The county is part of the 21st District in the United States House of Representatives, represented by Republican Lamar S. Smith, the 25th district of the Texas State Senate, represented by Republican Donna Campbell, and the 73rd District of the Texas House of Representatives and is represented by Republican Kyle Biedermann. President Lyndon Baines Johnson was born in Stonewall, in the eastern part of the county. The Lyndon B. Johnson National Historical Park, which includes much of the former president's LBJ Ranch, is located just outside Stonewall. Admiral Chester W. Nimitz was born in a house that still stands on Main Street in Fredericksburg. Nimitz, who grew up in Fredericksburg and in nearby Kerrville, graduated from the United States Naval Academy, rose to the rank of Fleet Admiral and commanded the Pacific War during World War II. Betty Holekamp, German colonist and pioneer, lived on a 320-acre (1.3 km2) parcel near Fredericksburg. Susan Weddington, state chairman of the Republican Party of Texas from 1997 to 2003, retired to Fredericksburg. Wikimedia Commons has media related to Gillespie County, Texas. ^ a b c Kohout, Martin Donnell. "Gillespie County, Texas". Handbook of Texas Online. Texas State Historical Association. Retrieved 13 November 2010. ^ Brister, Louis E. "Adelsverein". Handbook of Texas Online. Texas State Historical Association. Retrieved 13 November 2010. ^ Ramos, Mary G. "The German Settlements in Central Texas". Texas Almanac. Texas State Historical Association. Archived from the original on 7 February 2011. Retrieved 13 November 2010. ^ "Indianola, Texas". Blueprints For Travel, LLC. Retrieved 13 November 2010. ^ Block, W T. "The Story of our Texas' German Pilgrims". Blueprints For Travel, LLC. Retrieved 13 November 2010. ^ "Near River Crossing Used by New Braunfels' First Settlers – New Braunfels, Comal County, Texas". William Nienke, Sam Morrow. Archived from the original on 18 July 2011. Retrieved 13 November 2010. ^ a b c d Smith, Cornelia Marshall; Tetzlaff, Otto W. "Meusebach, John O". Handbook of Texas Online. Texas State Historical Association. Retrieved 13 November 2010. ^ Kohout, Martin Donnell. "Fredericksburg, Texas". Handbook of Texas Online. Texas State Historical Association. Retrieved 13 November 2010. ^ "Comanche Indian Treaty". William Nienke, Sam Morrow. Archived from the original on 18 July 2011. Retrieved 13 November 2010. ^ "Signers of Petition to Create Gillespie County December 15, 1847". Texas Gen Web. Archived from the original on 28 July 2011. Retrieved 13 November 2010. ^ Kohout, Martin Donnell. "Vereins-Kirche". Handbook of Texas Online. Texas State Historical Association. Retrieved 13 November 2010. ^ Spurlin, Charles D. "Gillespie, Robert Addison". Handbook of Texas Online. Texas State Historical Association. Retrieved 13 November 2010. ^ Brooks Jr, Paul R M. "Fort Martin Scott". Handbook of Texas Online. Texas State Historical Association. Retrieved 13 November 2010. ^ "Angry soldiers burn Fredericksburg store, destroying early Gillespie County records". Handbook of Texas Online. Texas State Historical Association. Archived from the original on 19 October 2012. Retrieved 13 November 2010. ^ Beverly, Travis Wooster. "Gillespie County Records Destroyed". Texas Gen Web. Archived from the original on 28 July 2011. Retrieved 13 November 2010. ^ Biesele, R L (April 1930). "The Texas State Convention of Germans in 1854". The Southwestern Historical Quarterly. XXXIII (24). ^ "Nimitz, Charles and Sophia". Der Stadt Friedhof. Gillespie County Historical Association. Retrieved 13 November 2010. ^ Kohout, Martin Donnell. "Nimitz, Charles Henry". Handbook of Texas Online. Texas State Historical Association. Retrieved 13 November 2010. ^ "Nimitz Hotel". William Nienke, Sam Morrow. Archived from the original on 7 July 2011. Retrieved 13 November 2010. ^ Moneyhon, Charles H. "The Union League". Handbook of Texas Online. Texas State Historical Association. Retrieved 13 November 2010. ^ McGuire, James Patrick. "Kkuechler, Jacob". Handbook of Texas Online. Texas State Historical Association. Retrieved 13 November 2010. ^ "Treue der Union Monument". Blueprints For Travel, LLC. Retrieved 13 November 2010. ^ "List of Dead-Treue Der Union Monument". Texas Gen Web. Archived from the original on 26 February 2012. Retrieved 13 November 2010. ^ Shook, Robert W. "Duff, James". Handbook of Texas Online. Texas State Historical Association. Retrieved 13 November 2010. ^ "Site of the McDonald Massacre". William Nienke, Sam Morrow. Archived from the original on 28 September 2011. Retrieved 13 November 2010. ^ "Fugutives from Justice". Texas Gen Web. Archived from the original on 3 October 2011. Retrieved 13 November 2010. ^ Hudspeth, Brewster. "The Savage Life Of Herman Lehmann". Texas Escapes – Blueprints For Travel, LLC. Retrieved 30 April 2010. Texas Escapes – Blueprints For Travel, LLC. ^ "Gillespie County Fair". Archived from the original on 17 January 2010. Retrieved 13 November 2010. ^ "Site of The Andreas Lindig Lime Kiln". William Nienke, Sam Morrow. Archived from the original on 28 September 2011. Retrieved 13 November 2010. ^ "Gillespie County Courthouse". Texas Escapes – Blueprints For Travel, LLC. Retrieved 30 April 2010. Texas Escapes – Blueprints For Travel, LLC. ^ Potter, Elmer Belmont (2008). Nimitz. Naval Institute Press. p. 26. ISBN 978-1-59114-580-6. ^ a b c "President Lyndon B. Johnson's Biography". LBJ Library. Archived from the original on 18 January 2012. Retrieved 13 November 2010. ^ "Gillespie County Historical Society". Retrieved 13 November 2010. ^ Wentsch, George. "Pedernales Electric Cooperative". Handbook of Texas Online. Texas State Historical Association. Retrieved 13 November 2010. ^ "History of the Easter Fires". Texas Less Traveled. Retrieved 13 November 2010. ^ "Pacific War Museum". Archived from the original on 9 November 2010. Retrieved 13 November 2010. ^ a b c Kohout, Martin Donell. "Nimitz Museum". Handbook of Texas Online. Texas State Historical Association. Retrieved 13 November 2010. ^ Kohout, Martin Donell. "Enchanted Rock State Natural Area". Handbook of Texas Online. Texas State Historical Association. Retrieved 13 November 2010. ^ Leip, David. "Dave Leip's Atlas of U.S. Presidential Elections". uselectionatlas.org. Retrieved 2018-01-25. ^ "Fisher Miller Colony Transfers". Texas General Land Office. Archived from the original on 26 July 2011. Retrieved 26 May 2011. Biesele, Rudolph Leopold (1930). The history of the German settlements in Texas, 1831-1861. Press of Von Boeckmann-Jones Co. – via HathiTrust. Biesele, R. L. (April 1930). "The Texas State Convention of Germans in 1854". Southwestern Historical Quarterly. Denton, TX: Texas State Historical Association. 33 (4): 247–261. Hoffmann, David R. (April 1999). "A German-American Pioneer Remembers: August Hoffmann's Memoir". Southwestern Historical Quarterly. Denton, TX: Texas State Historical Association. 102 (4): 486–509. McGowen, Stanley S, (July 2000). "Battle or Massacre? : The Incident on the Nueces, August 10, 1862". Southwestern Historical Quarterly. Denton, TX: Texas State Historical Association. 104 (1): 64–86.